This species of Tillandsia (?) has the peculiar habit of growing on rock faces with its soft, floppy leaves weeping downward. 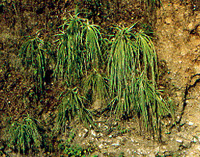 In contrast, many bromeliads have very still leaves.